Hello! It’s Easter Sunday, and I’m spending it eating copious amounts of chocolate and relaxing…what else is it for?! I thought today would be a great time to write up and share with you my recent review of the Hotter event in York. 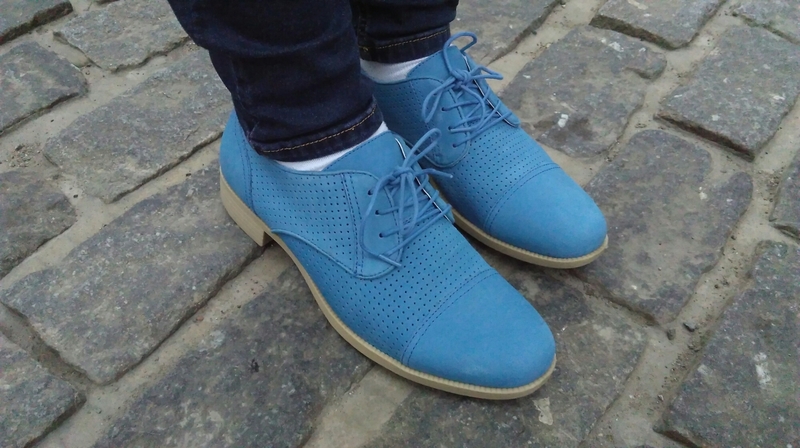 I’m already a Hotter convert as I own a couple of pairs of formal Poplar shoes, but I bet most of you will be associating Hotter shoes with footwear for the older generation; in other words comfortable, but not necessarily stylish or fashionable. If this is the case, I hope to change your mind: Hotter really has something for everyone of any age and any taste! 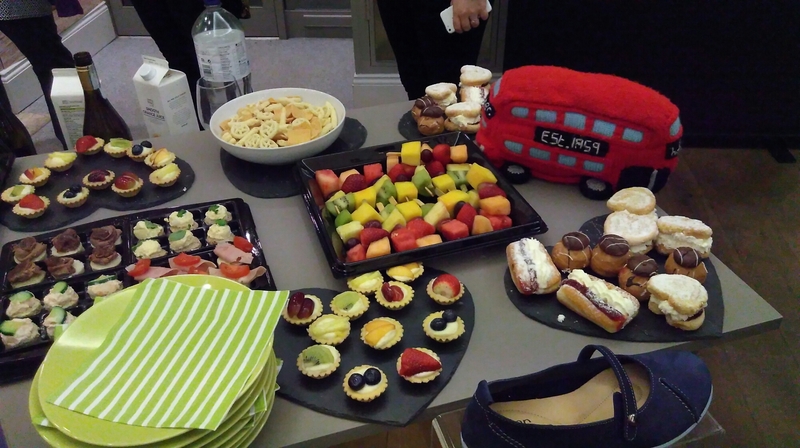 Our night began with glasses of prosecco and a wonderful selection of savoury and sweet canapes. We mingled with the staff of the Feasegate store and had a very quick glimpse into what the Spring/Summer ’16 collection has to offer. Next we sat through a quick presentation on the company behind the product, where Mel explained the origins of the company which started in 1959. 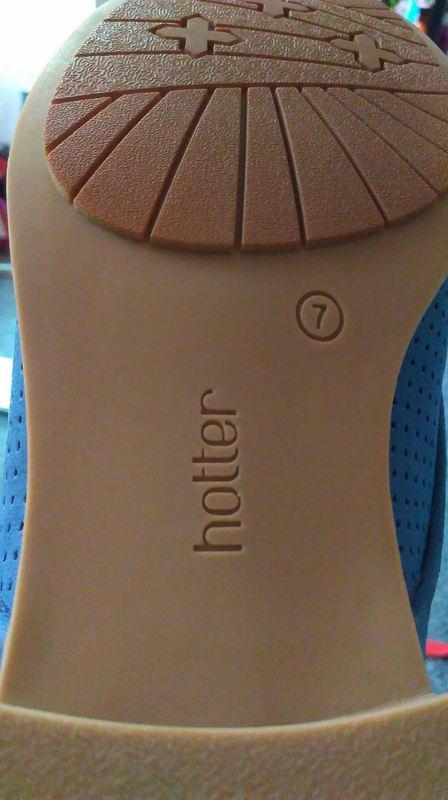 Hotter shoes originally traded as Beaconsfield footwear, and manufactured a range of comfortable slippers and unbranded shoes. 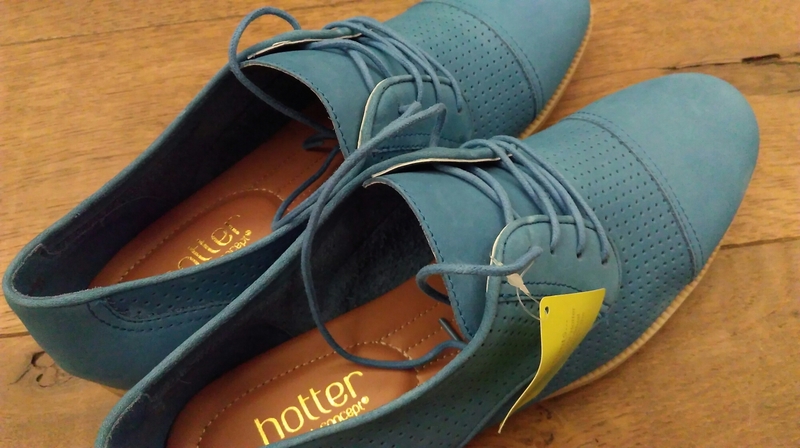 Eventually Hotter became the company it is today, and decided to sell shoes just as comfortable as slippers. 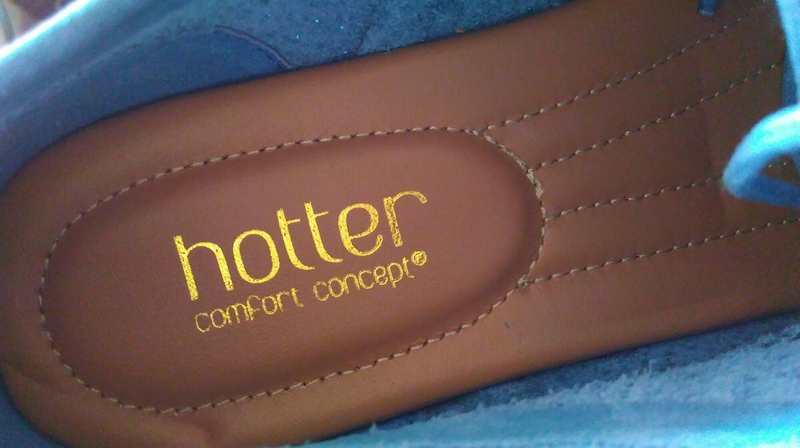 Hotter are proud of their ‘comfort concept’ features hidden within each pair of shoes, and ensure comfort from the very first step. These features include wider fittings when required, roomy toe boxes for wriggle-room and ultra supportive insoles. Each of the shoes is crafted using the finest quality leathers and other materials, and each sole is filled with millions of tiny air bubbles ensuring a comfortably light step. 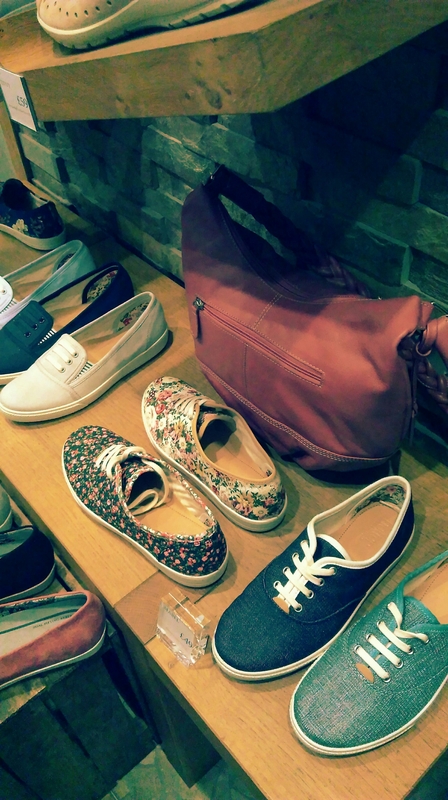 Surprisingly Hotter is also the UK’s biggest shoe manufacturer, crafting an amazing pair of shoes every twenty seconds. 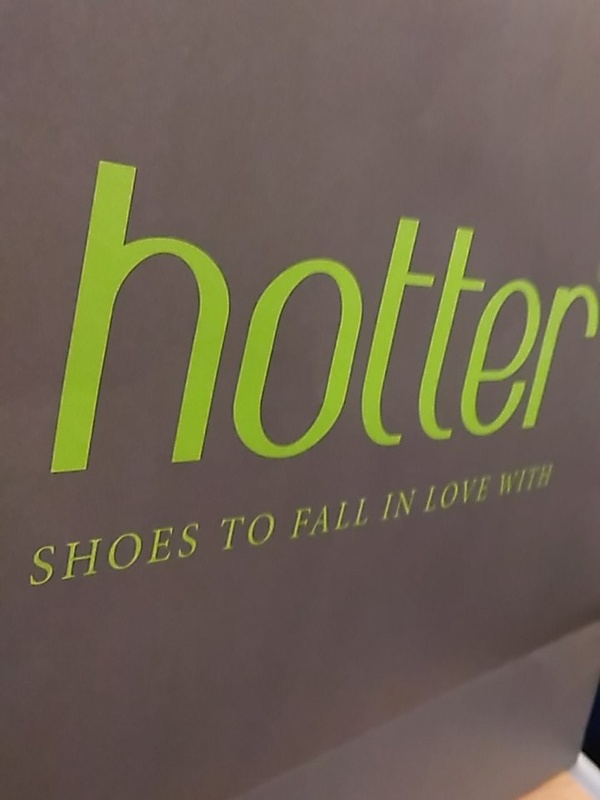 Though Hotter’s factory is still based in Lancashire, Hotter now sells shoes as far afield as the US, and its call-centre is open til the early hours of the morning to cater to these customers. Although you can now buy Hotter’s products online, there are an amazing 75 stores nationwide where you will receive exemplary customer service from friendly and knowledgeable staff. 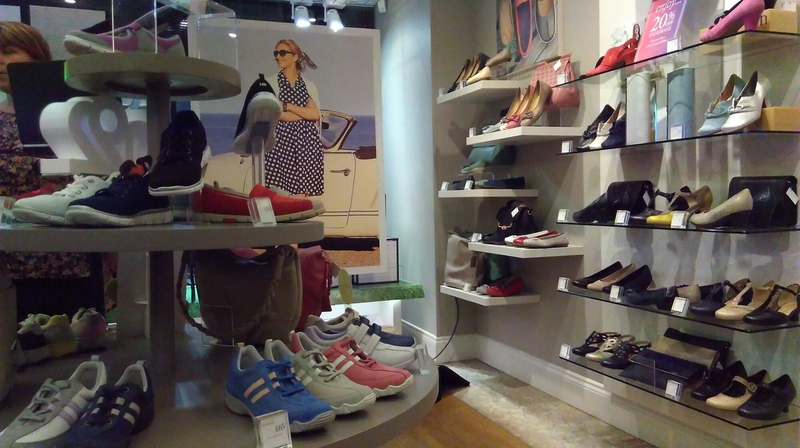 Hotter’s shoes for Spring and Summer come in a huge array of styles and bright, summery colours. I was pleasantly surprised by the huge variety on offer. 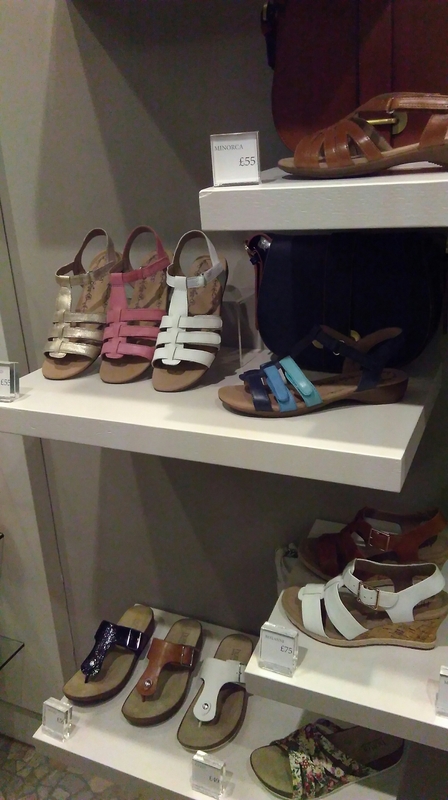 There’s a fabulous selection of sandals and wedges, which will look amazing for a stroll on the beach or for relaxed summer evenings. 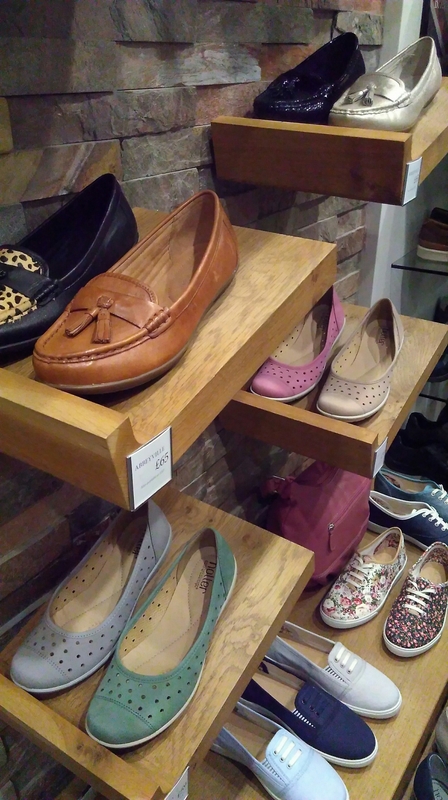 The flat slip-ons are available in a variety of styles and colours, and the Jewel and the Livvy styles would be particularly good for warm weather! I particularly love the pastel shades of the Livvy style, and the Jewel has a rather gorgeous floral on offer. 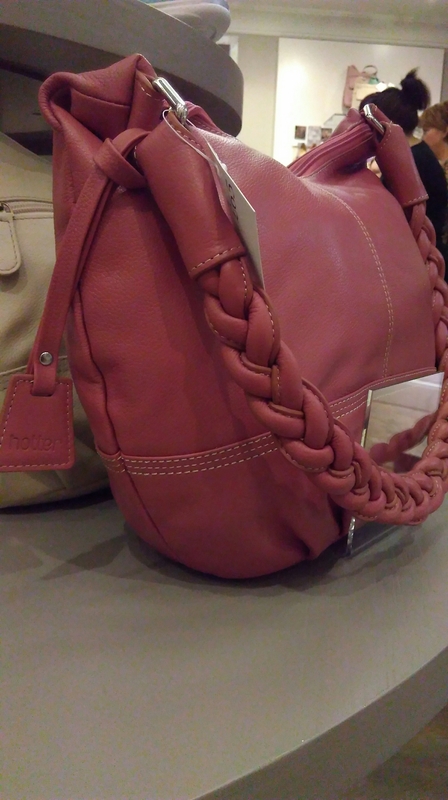 There are also beautiful handbags to complement each pair of shoes and to complete an outfit. I particularly love the dark pink colour! 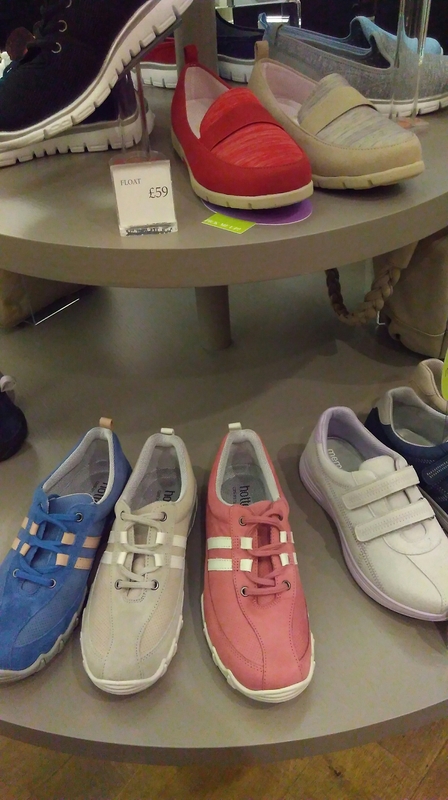 Even those who live in trainers and active wear will find a pair perfectly suited for them. 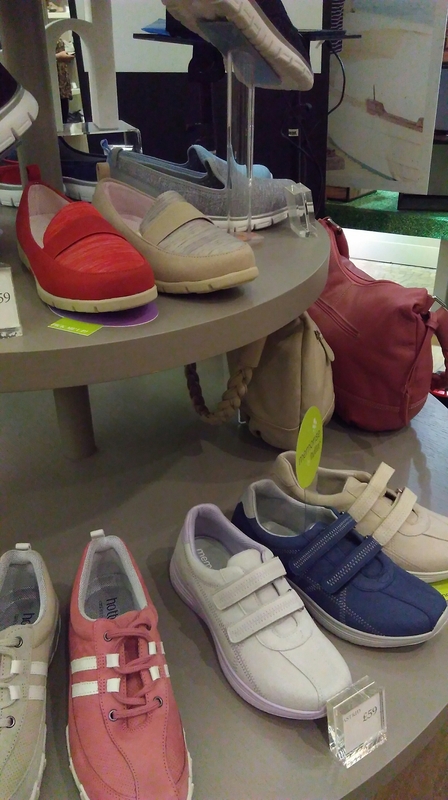 Hotter’s new h92 collection comes in an array of colours, and features thick luxurious memory foam insoles. These are incredibly light, and I tried on the Float pair. The red colour is absolutely wonderful! Bounce is also beautifully crafted. 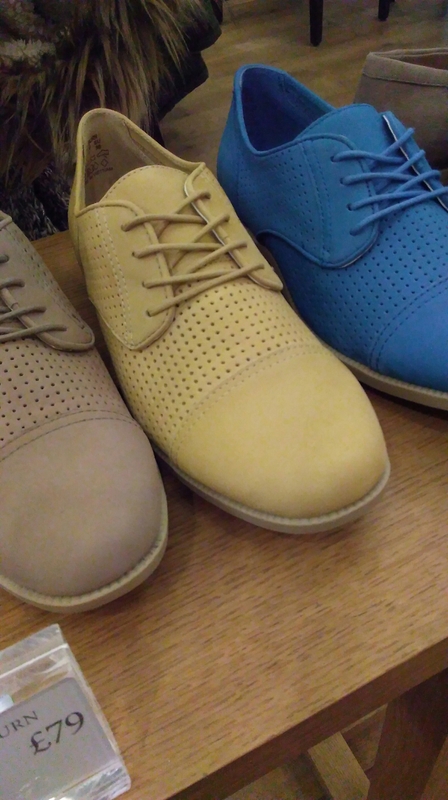 If slip on active footwear isn’t your thing, you can pick up a pair of the lace-up Feather shoes. Gorgeously comfortable and perfect for summer walks. There’s plenty of heeled shoes on offer, too. I didn’t try any on (blame the cerebral palsy!) but one of the girls picked up a beautiful silver pair of Donna shoes that looked absolutely amazing. The loafers including the Abbeyville, Brierton and Sorbet would make the perfect pair of smart work shoes. 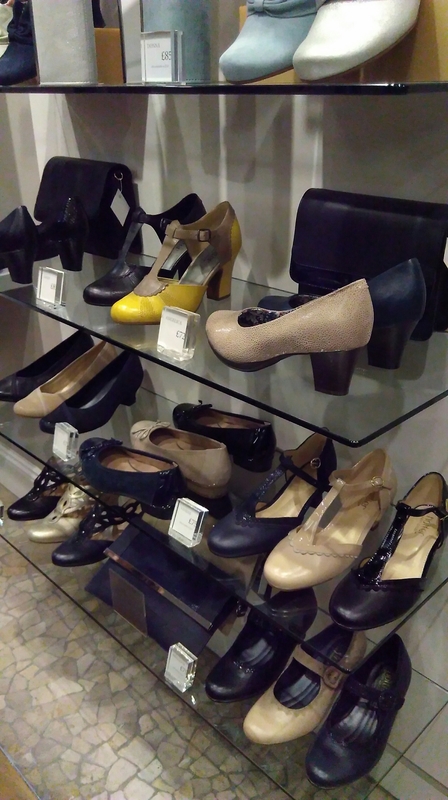 I tried on a pair of the Abbeyville shoes and they were gorgeously soft and flexible! 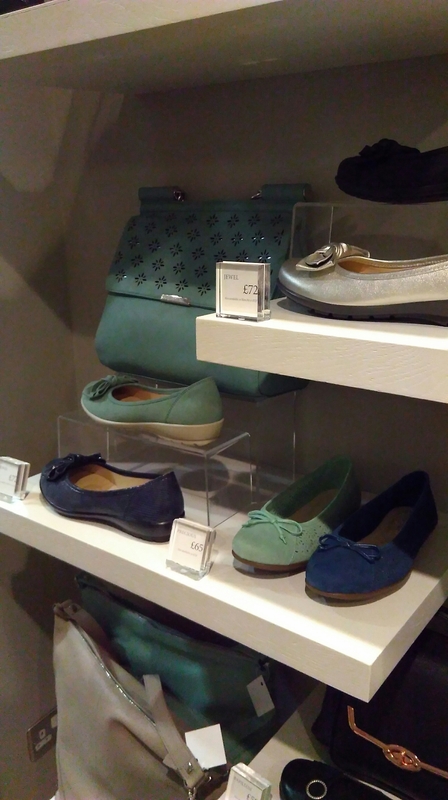 The casual shoes – Mabel and Essmy – are available in a range of styles, including gorgeous nautical-inspired colour palettes and floral finishes. 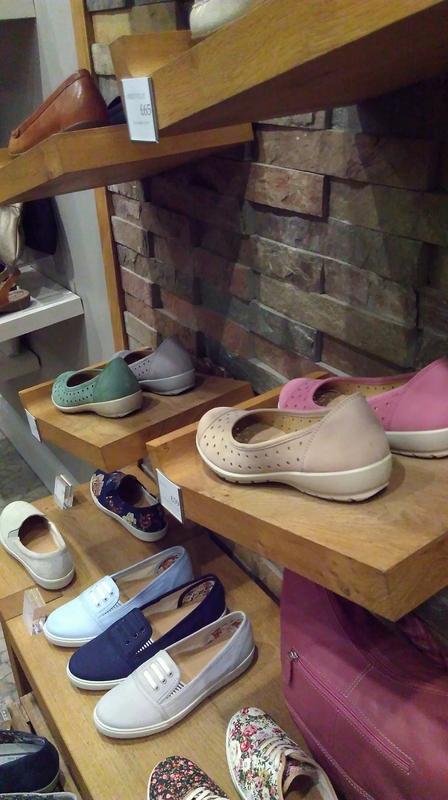 After looking through the Spring/Summer catalogue I have my eye on the washable Biscay shoes, which look gorgeously bright and summery. I don’t think they were available in the store on the night because I would have definitely tried them on if so! ‘Mannish tailoring’ is a key trend this season, and when I set eyes upon the Saltburn shoe I knew I just had to try them! These brogues feature gorgeous pepper-pot punching detail crafted using the softest nubuck leathers. I quickly fell head over heels (sorry, couldn’t resist!) 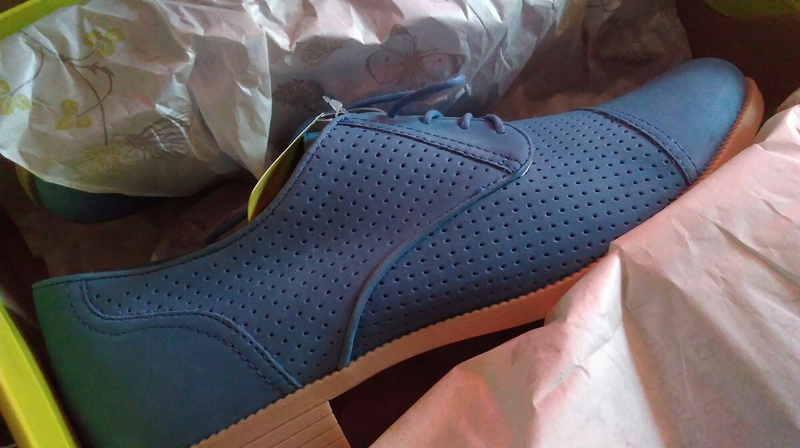 for these, particularly the French Blue colour. 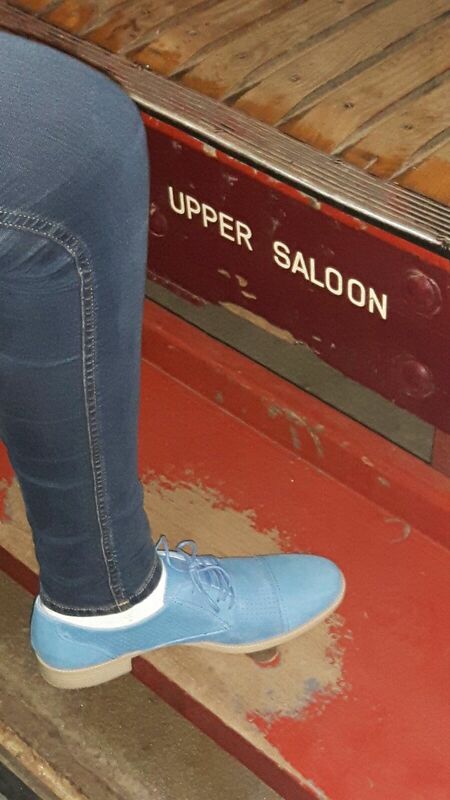 We were each given a pair of shoes to take home and review, and I knew the Saltburn shoes had to be mine. Aren’t they gorgeous? I took some pictures of them whilst exploring the museum quarter in Hull’s Historical Old Town. I’m loving the versatility of these and think they look great with jeans, dresses, skirts and even formal workwear! I have a blue blazer that would complement these perfectly. I already have my eye on more in the collection, and really recommend you give Hotter a visit; there’s something for everyone! Many thanks to the wonderful folks at Hotter for having me. I really enjoyed myself and I’m now the proud owner of a very beautiful (and comfortable!) pair of shoes! Do you love Hotter, too? Let me know what you think in the comments! PS; for more pictures and a glimpse into all things nosuperhero, why not check out my instagram, snapchat and twitter? Just search for @htlcy. I’d love to see you!